Intellectual Property Associate – Large Law Firm – Atlanta, Ga.
Morris, Manning & Martin, LLP is now accepting resumes for a full-time IP / Patent Associate position in our Atlanta office with 3-5 years of experience. The ideal candidate will have experience in not only patent prosecution matters, but also trademark matters, opposition and cancellation proceedings before the TTAB, agreement and licensing matters, and other IP-related activities. A degree in electrical engineering, mechanical engineering, computer engineering, computer science, or physical science is strongly preferred (but not required). Must be admitted to practice before the USPTO and the Georgia Bar (or committed to becoming a member of the Georgia Bar). Very competitive benefits package and great opportunity for professional growth. MMM expects its mid- and senior-level associates to take significant part in managing client relationships, overseeing client portfolios, and helping to grow the practice through business development. 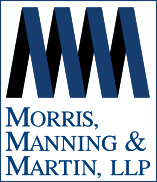 Morris, Manning & Martin’s reputation for providing creative and goal-oriented solutions to our clients’ intellectual property legal issues has made us one of the leading intellectual property practices in the Southeast. We represent hundreds of companies throughout the United States and abroad in intellectual property matters. To apply, please email your resume & transcript to cshaheen@mmmlaw.com.